Thera-Band exercise bands are low-cost, portable, and versatile resistance products. Endorsed by the American Physical Therapy Association (APTA) and recognized worldwide as the original System of Progressive Resistance. 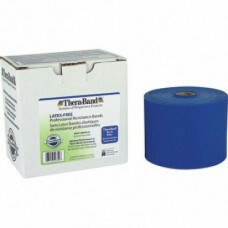 Thera-Band exercise bands are ideal for building upper and lower body strength for rehabilitation and fitness. The progressive resistance of this product parallels the basic concepts of building strength and mobility. Resistance can be increased as each level of a rehabilitation or strength program is mastered.